The Breath-A-Tech Spacer is a compact and durable spacer, suitable for use with all standard puffers. The Small Silicone Mask is for children aged 0-1. 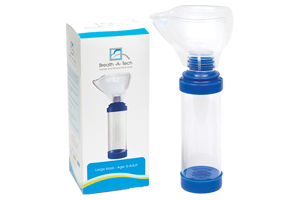 The Breath-A-Tech Spacer is designed to improve the delivery of aerosol medication from puffers in the management of asthma and COPD, helping you to breathe better. The Silicone Face Mask is recommended for patients who have trouble using the mouthpiece of the spacer. The Small Silicone Face Mask is for children aged 0-1. Shake the puffer immediately before each use. Insert the puffer into the flexible end cap of the spacer, remove protective safety cap from the mouthpiece, place mask on mothpiece and hold up to mouth. Press the puffer once to dispense a single dose of medication and breath in and out normally for about 4 breaths. If a second dose is required, pause one minute before repeating procedure. The Breath-A-Tech Spacer is a compact and durable spacer, suitable for use with all standard puffers. The Medium Silicone Mask is for children aged 1-5. 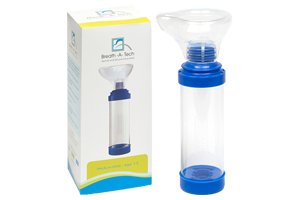 The Breath-A-Tech Spacer is designed to improve the delivery of aerosol medication from puffers in the management of asthma and COPD, helping you to breathe better. The Silicone Face Mask is recommended for patients who have trouble using the mouthpiece of the spacer. The Medium Silicone Face Mask is for children aged 1-5. The Breath-A-Tech Spacer is a compact and durable spacer, suitable for use with all standard puffers. The Large Silicone Mask is for aged children aged 5-adult. 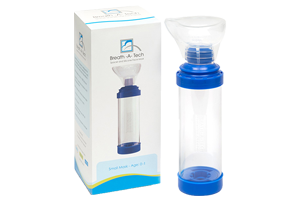 The Breath-A-Tech Spacer is designed to improve the delivery of aerosol medication from puffers in the management of asthma and COPD, helping you to breathe better. The Silicone Face Mask is recommended for patients who have trouble using the mouthpiece of the spacer. The Large Silicone Face Mask is for patients aged 5-adult.